Down will face Donegal on the opening night of Football League action on Saturday 30 January with Dublin hosting Kerry at Croke Park that night. Games on the first league Sunday include a trio of Division 2 contests with Derry facing Fermanagh, Meath v Armagh and Tyrone meeting Cavan. The following week's fixtures include Cavan's Saturday night game with Derry and Monaghan's clash with Down. Antrim's Division 2A Hurling season starts on 14 February away to Derry. After a three-week break, Football League action will resume on Saturday 27 February with Dublin facing Monaghan at Croke Park and Armagh taking on Fermanagh in Division 2. 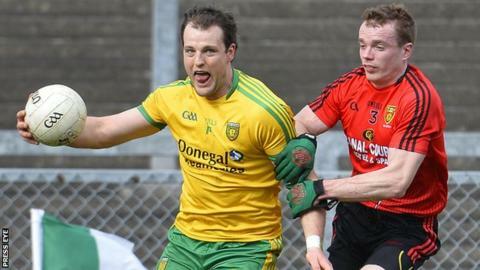 The next afternoon Down will play Kerry at Newry with Donegal hosting Mayo at Ballybofey. The Division 2 Ulster derby between Tyrone and Derry will take place in Omagh on Saturday 5 March with Cavan hosting Armagh on the same night. Division 1 games on Sunday 6 March include the meeting between Kerry and Donegal at Tralee while Down will welcome All-Ireland champions Dublin to Pairc Esler on Saturday 12 March. The penultimate round of fixtures will include Saturday night games on 26 March with Dublin hosting Donegal at Croke Park plus the meeting of Tyrone and Armagh at Healy Park. All the concluding round of games will take place on Sunday 3 April when the fixtures will include Monaghan's meeting with Donegal at Clones, Armagh's game against Derry and Fermanagh's contest against Tyrone.